How To Make The Most Out Of Google Search? You're looking for something, but you can't really find it. What do you do? You search for the nearest synonym. So instead of searching for each synonym individually, you can use the tilde (~) character before a search term to indicate that you're looking for approximate matches. This trick has been a lifesaver on many occasions for me, and is one of my favorites. It is especially helpful if you're looking for documents, or presentations to gather some research data or see how others have done it. But instead of searching the whole web, you can specify a file type (.ppt or .doc) to see relevant results only. Just add "filetype:PPT" at the end of a search query to look for a specific file type. This trick is especially useful if you want to research products that fall within a certain price range, for e.g. smartphones. Type in your search term, and then separate the low and high price range with two periods (..). You can also use this trick to work with dates, i.e. look for an article published within a specified period. Don't you just hate it when you know the most part of a phrase, but can't remember one key word? The lyrics of a song maybe, or something your chemistry teacher told you about, but you can't remember what reacts with what to make what. Well, Google does a very good job at helping you out there. Enter your search tern, and replace all unknown words with an asterisk. It is considered as a blank, and Google will try to find the answer for you. For those of you who like to keep tabs on how much time they're spending on a certain activity online, this Google timer can be invaluable. You can now set a countdown timer without having to install an app. Simply type in "set timer for" in the search bar, and watch as a timer appears. Set the time, and hit "Start." You'll hear an alarm go off when the time ends. You want to search for a specific title, instead of keywords contained within an article? Simply type "intitle:" then the term you want. 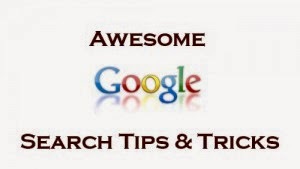 This will ensure the specified term is in the title of all the webpages in your results. You read an interesting article about link building on QuickSprouts, but you don't have the link and you can't remember the article's name or its author. Or maybe you'd like to search more such articles by the same author. Simply type "site:" followed by the URL of the website you'd like to search. Then add your search terms. You want to find out the origin of a quote, but Google keeps giving results that are nowhere close. Put your search phrase inside quotation marks, and Google will search the words in the exact order you enter them. You've received a payment from abroad in US dollars, and want to know how much you have in your local currency? Type in the name of the currency you currently own, add "to" and then type in the name of the currency you need to get. You want bread recipes that don't list "yeast" as an ingredient. Or maybe you want to pull video results that are not from YouTube. Either way, you'll have to use an exclude query. After you enter your desired search terms, add a minus sign (-) followed by the words you want excluded.